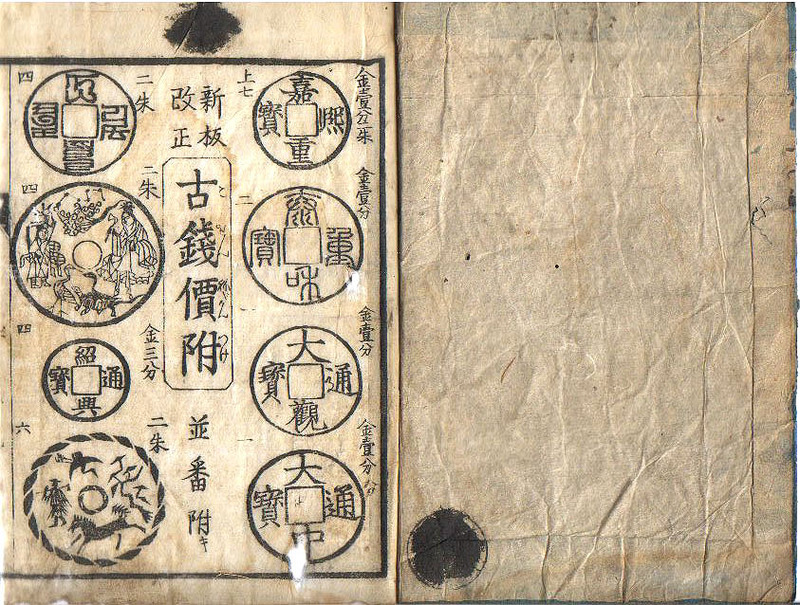 This is the inner front cover of Kosen nedantsuke ( Price List of Old Coins), published in the city of Nagoya in 1799.This book belongs to the collector Sam Leung who kindly provided me with the images and allowed me to present these at my site here. The title runs down the center of the page and then it has images of a number of interesting coins placed around it. Each coin has a monetary price, in gold units, at its upper right corner and a rarity ranking at its upper left corner. For example the top left coin is the 10 mon Mongol coin, Da Yuan Tong Bao, of 1308-1312, an its value is 2 shuu of gold. One shuu was worth about 250 mon, or 250 small copper coins. The relative raity rating of this coin was 4 on a scale of 1 to 10 with 1 being most rare and 10 being most common. Right below the Mongol coin is a charm first made in the Song dynasty. It has listed the same value. Here as elsewhere in the book, charms and coins are mixed indiscriminately. Just as is the case with the Shinsen zenikagami, there is only a modicum of effort put into logically organizing the coins by such categories as date of manufacture, country of production, official currency or private counterfeit, or picture charm etc. : All of the categories important in organizing modern coin books. Both books also display amost no interest in stylistic variants of single coin types, which is at the core of serious collecting today. The two black smudges are where one owner has blacked out the seals and/or names of a previous owner. The quality of the paper on the inside cover and the book itself is different and suggests that perhaps the cover was added later. Originally the book may have been sold as a pamphlet, without any exterior cover. This is just a guess on my part.